Ann and I have been arrived back in Sydney from Airlie Beach last week and we are still trying to re-acclimatise, not that we can whinge too much about the winter weather here, it’s just that the weather in the Whitsundays at this time of the year is so damned good! Sunrise posing with her new sails, Hanna Point (North Molle Is.) in the background. is the 12th time in 13 years that we have done so. 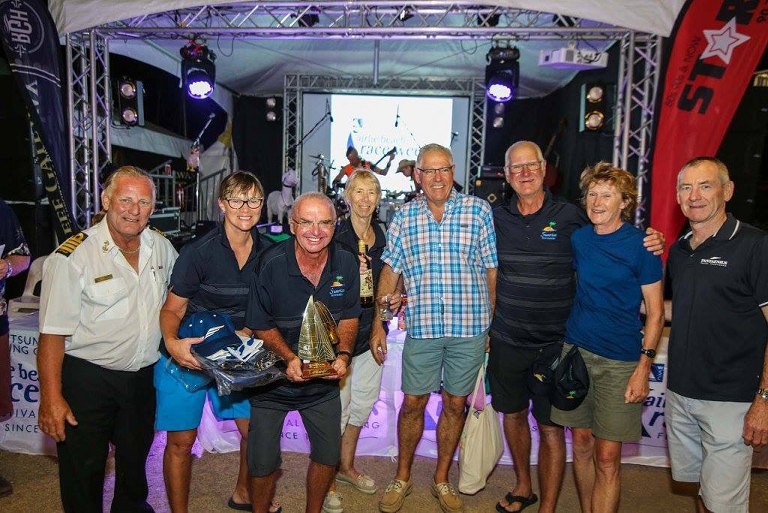 There was one year that Helen and Jeff had the temerity to travel overseas during the Regatta! It is always a pleasure to visit Airlie Beach, not only to see Helen and Jeff but also to catch up with a number of people we now count as friends in the area. Helen and Jeff first entered “Sunrise” in this regatta in 2005 only a few months after taking delivery of her, prior to this year their best result was a second in their division, having just written that it is obvious that this year was the most successful yet with a victory in the Cruising Non-Spinnaker division. While we always race to win, both on G-whizz and most other boats that we crew on, we are aware that when racing under the PHS handicap system it can be a bit of a lottery, as your first race handicap can set you up for the series, or put you behind the 8 ball. Handicappers do the best job they can, especially recognising the difficulties in finding a relative performance base for such mixed fleets, with boats that they have very little knowledge of. I am not about to criticise the handicappers as that would imply that I could do a better job! There a number of theories about winning a PHS regatta, many of which say that you manage your performance as you go through the regatta, we have a simpler theory, sail the boat as well as you can and try to sail it better each day, we can get an idea of this by looking our performances on scratch, and in this regatta we just kept getting better, our scratch results for the 5 races that were started were 8, 7, 4, 3, 3. With finish times that were always getting closer to the top boats. By comparison the handicap results were 6, 1, 1 , 1, 3. The crew and the trophy. Stuart Harris Commodore WSC, Ann, Jeff, Helen, Harry, Graeme, Jill and the Pantaenius rep. While we are all stoked with our win in the division, it was not until the evening of the presentation that we found out that we were also the best performing local boat, another trophy for Helen and Jeff’s mantle and lots of goodies thanks to Pantaenius insurance, Captain Morgan Rum (yummy) and Great Northern Brewery. There was also a bit of sadness, Airlie Beach really got hammered by cyclone Debbie back in May (does Debbie really deserve to have a capital?) As a result the local boat entries in this year’s regatta were a little lower than normal, there is still some visible damage to the area, mostly evident in the still recovering vegetation and the number of retail businesses that are yet to re-open pending repairs to their properties (I really feel for these small business people, I cannot imagine what they must be going through), the Marina suffered pretty badly, but is now almost back to full capacity. It is also sad to see all the bruised boats sitting in their pens. All credit to the Town, it is still as welcoming as ever and will very soon be back to full operation, get up there have a great time and drop a few dollars into the local economy. 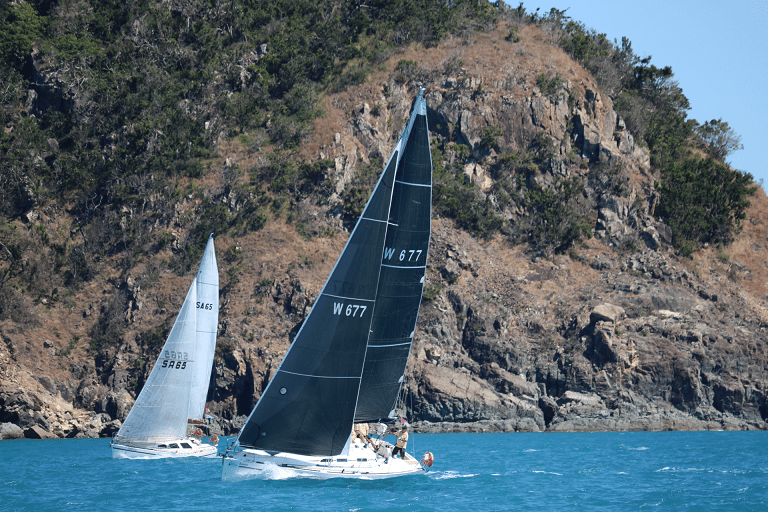 For next year if you own a boat and are considering any of the Whitsunday’s regattas, put Airlie Beach on you list it is a fun and friendly regatta, and you can do it while living on the mainland.